Edio Deciantis (later changed to Eddie De Santis) was born in Detroit on November 4, 1925, the third child of Rosalba and Vito Deciantis. His parents immigrated to the US from the Frosinone area of Italy, his mother in 1920 to Monroe, Michigan and his father in 1915 to West Virginia. Finding coal mining uninspiring, Vito Deciantis encouraged by his friends, moved north to Detroit where he found worked at Ford Motor Company. Through mutual acquaintances he met and married Rosalba Bastianelli in 1921. Their first home was located upstairs over the famous Roma Café. Eddie’s father was always an inspiration, instilling pride in a job well done and never to give less than 100% effort in any endeavor. Eddie’s desire to play music and to entertain began at the age of nine, he would study any instrument just to be able to play music. It was months before he made the decision that his instrument of choice would be the Accordion. He was taught by Thomas Rea for the first year, then with Peter Davy who taught at the Universal Accordion Manufacturing Company, located on Broadway Street in Downtown Detroit. The only means of transportation for Eddie was the Baker Street Car Lines and the fare at that time was six cents. Every Saturday morning Eddie’s mother would give him $1.00 for the music lesson and a $0.25 for the street car fare andreminded him to “bring back the change” as times were thought financially in the 1930’s. Eddie continued his studies with Peter Davy until his talent was recognized and he was enrolled at Cass Technical High School renowned for its acceptance of outstanding students, where he began the study of the elements of music and traditional harmony. This was a happy time for Eddie being with other music students – talking music – walking with music – learning from the finest of instructions with sincere discipline. He learned and appreciated the different moods of expression and the true color of sounds. At Cass Technical High School, Eddie had other classes too such as Piano as well as the elements with some harmony language with Mrs. Kenk, String Bass with Rodney Blood and oboe with Carlton Rosser. They taught him well and he never forgot them. In his last years of high school he started teaching the Accordion at the downtown Wurlitzer store and playing in a wonderful Polish band at the Warsaw and the Mazurka restaurants. It was at Wurlitizer he met his wife to be Shirley Burdette as she was taking vocal lessons there. Over the years Eddie would grow his family to five beautiful children and many grandchildren. The war came, but before Eddie entered the service, he attended a seminar with Anthony Galla-Rini and took private lessons with him. Uncle Sam beckoned and Eddie entered the Army Corps of Engineers (Combat Engineers), bringing his Accordion with him throughout his Army career along with his rifle, duffel bag and equipment he trudged all over Europe, playing his beloved Accordion wherever he could. He ended up at “The Rhineland” in Germany. When he returned home to the USA he continued studies with Bernhard Heiden a student of Igor Stravinsky when he was with the Detroit Chamber Orchestra. From Mr. Heiden he learned about Solfeggio (a vocal exercise in sol-fa syllables) and ear training and harmony. With instructor Ed Barrow, he learned about arranging and harmony. 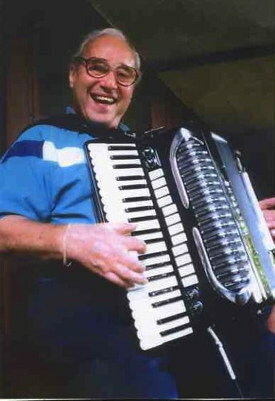 He also performed on the D & C Cruise Ship Lines and the Georgian Bay Crusie Ship Lines and became the staff musician with WXYZ from 1950 to 1954 when radio and television studio’s carried live music. He did the morning show with “Warren Micheal Kelly” from 7:00 – 9:00 am, and at 11:45 to Noon he would do a show called “Hometown Hoe-down” and by 3:00 pm he was back on the air with “The Phil Brestoff Orchestra”. Eddie became leader of the band at the famous Whitter Hotel’s Gold Cup Room and Al Green’s in Grosse Pointe, MI. He also performed at the Old Statler Hotel, The Book Cadillac Hotel, Beauchamps, The Stage Door, and the London Chop House along with many others. Eddie left the comfort of “steady” employment to organize a string group, “The Singing Strings”, comprised of Eddie on the Accordion, string bass, four talented and beautiful girls playing violins, and vocalist Donna Watkins, and they worked most of the auto shows. He worked with and for many important stars including Jerry Colona, Eddie Cantor, Soupy Sales, The Harmonics, Danny Thomas, Bob Hope, opening for Tex Beneke and many others. He even backed a beautiful young blonde lady by the name of Miss Eva Gabor. Eddie taught music for twenty-five years, passing on his knowledge to his students at Fava Music Studios, The Detroit Conservatory and the Birmingham Conservatory. Performance were the most important part of Eddie’s career, working over 200 dates each year. The study of music was not easy for Eddie with 10% God-given talent and 90% hard work; he always thanked the Almighty Above for the gift of 10% and also for providing him with the determination and consistency to be a great musician.